Pressure cookers have intrigued me for nearly 50 years. They've also scared me that long, thanks to the monstrous meal-making machine that spouted steam and terror in my mom's kitchen as well as my grandma's decades ago. I've always wanted to learn how to make meals with a pressure cooker. It just seemed that's what grandmas are supposed to do. Or at least try. But the idea the pressurized pan might go kabang has prevented me from giving such culinary craftiness a try. Until now. Until I learned there's an electric — safe and kabang-proof — pressure cooker. Until I was offered the opportunity to review for free the safe, sturdy, and stylish Electric Pressure Cooker by Cosori. When I first unpacked and prepared my pressure cooker for cooking, my husband asked, "Are you sure that thing's not gonna explode?" Which confirmed that he, too, recalled pressure-cooker fears from days gone by. Which also confirmed that my thorough reading of the instruction manual before attempting using it was a wise choice. After reading the manual, I no longer feared my first effort in the multi-use Electric Pressure Cooker by Cosori would go up in smoke — or anything more scary. In fact, I was pretty confident I knew what I was doing, as the manual clearly explained all the parts, functions, controls. And how to safely vent the pressure from the pot after cooking via two methods: allowing the cooker to cool down on its own until the float valve (the thingee that rises as pressure does, falls as pressure does) drops down or by carefully moving the exhaust valve to gradually but more quickly release the steam. My first attempt was barbecued country pork ribs. 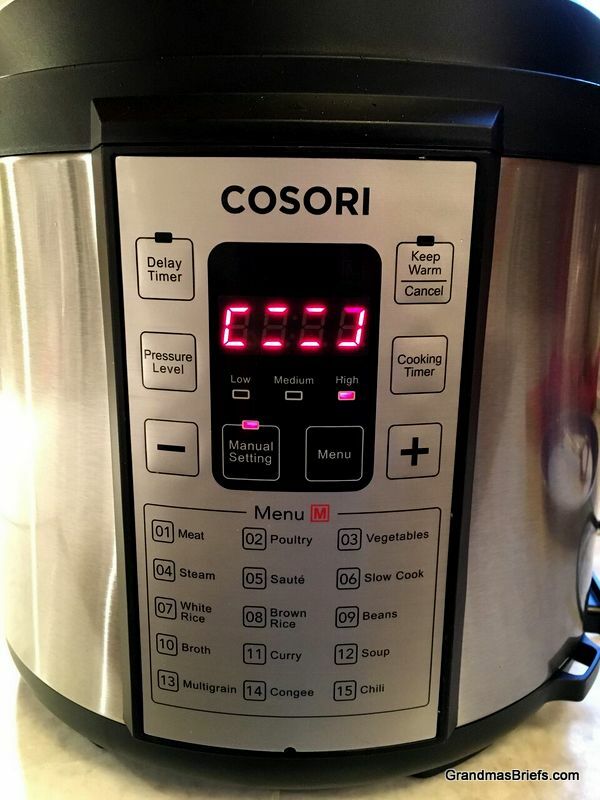 The Cosori Electric Pressure Cooker has nine preset cooking modes — Meat, Poultry, Vegetable, Steam, Sauté, Slow Cook, White Rice, Brown Rice, Beans — and the Sauté function was the perfect way to start off my ribs. I sauteed them til slightly browned, then poured on BBQ sauce, carefully secured the lid and steam vent, and set the manual cooking option to cook on high for 20 minutes. All done and perfect, inside and out! 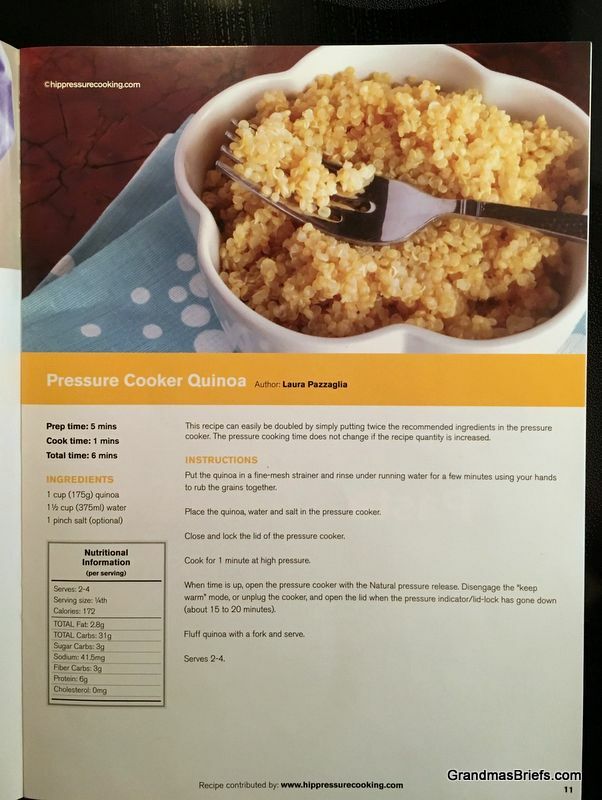 My next venture was a quinoa recipe from the accompanying Electric Pressure Cooker Recipe Cookbook. It noted the cook time was one minute — that's ONE MINUTE — and I wanted to see if that could possibly be true. It might have been... if I had allowed the pressure to release naturally for 20 minutes after cooking, as the recipe says to do. That seemed ridiculously long, though — longer than the cook time, by far — so I rushed and released the steam myself. 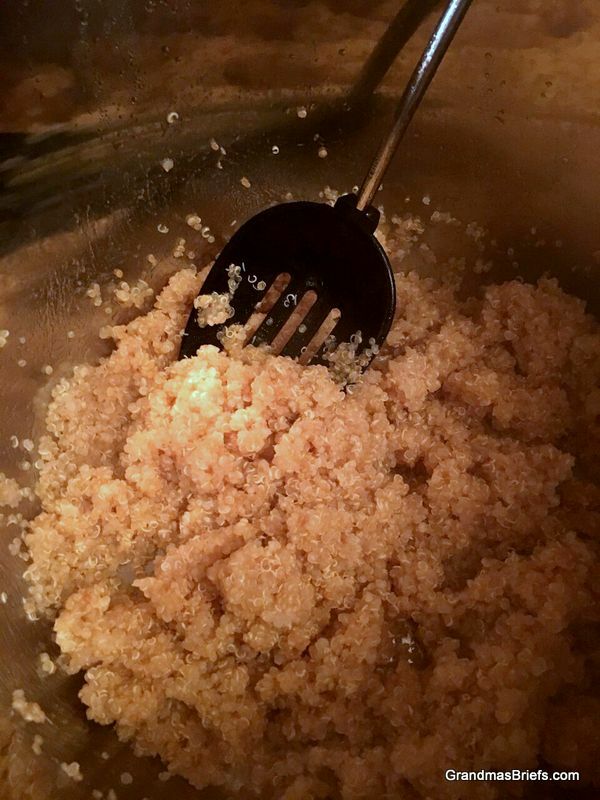 And ended up with soggy, not fluffy, quinoa. I'll be more patient next time. There are many more yummy looking recipes in the cookbook but I wanted to try winging it on my own for a final food for this review. I had pork chops on hand, plus potatoes and onions. So I sauted the chops then added sliced onions and potatoes plus some chicken broth, parsley and pepper. I set the cooker to pressurize and prepare my dinner. In 20 minutes dinner was done! And quite tender and tasty. I'm no longer afraid of pressure cookers. In fact, I'm quite impressed with the Electric Pressure Cooker by Cosori. • In addition to functioning as a pressure cooker, it can be used as a slow cooker, a rice cooker, a simple sauté pot that keeps splatters in the pot and off the stove/counter. • The stylish stainless steel inner pot is perfect for serving from for casual dinners. A pretty glass lid tops off the pot to keep things warm. • Cooking is quick, cleanup is simple. • Speaking of keeping warm, the cooker automatically converts to a "keep warm" setting once cooking is complete. • The pressure cooker automatically powers of if it beings to overheat so there's no chance of circuit overload, fire, explosion. • The package comes with all one needs for preparing perfect pressure-cooked meals: The pressure cooker, plastic spoon, plastic ladle, measuring cup, glass lid, sealing ring, user manual. And a cookbook! My only grumble about the Cosori Electric Pressure Cooker has nothing to do with the appliance itself, but with the cookbook that came with. The prep time and cook time for each recipe is clearly noted, but no mention of the time required for pressure to build up nor time for one must wait for it to release before safely opening the lid. As the time for both can be 10-20 minutes, it definitely affects the prep time and should be kept in mind when preparing meals. All in all, I see the Electric Pressure Cooker by Cosori becoming a valued, oft-used appliance at my place. And thankfully using it when my grandkids are around will never scare the bejeezus out of them as my grandma's did me. 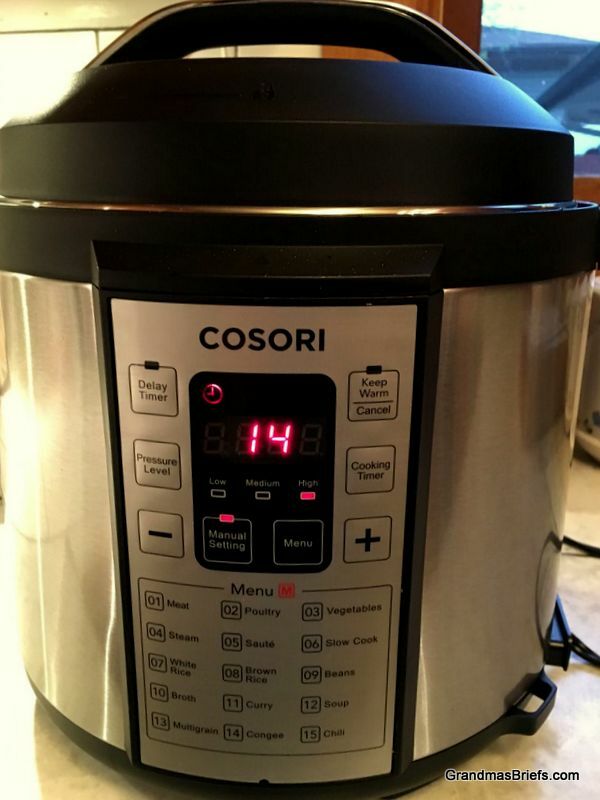 Find out more about the Electric Pressure Cooker by Cosori at Cosori.com. The appliance retails for $349. Disclosure: I received this product free for review; opinions are my own.